A Cumbrian social enterprise that recycles and reuses electronic goods is thriving due to a recent move to larger premises. Cumbria Recycling Limited was set up six years ago to collect, recycle and trade electrical goods. Due to their growing success and help from the NMP Community Fund, they have relocated to a new larger building at Lillyhall and increased their workforce. The social enterprise was able to completely strip-out and refurbish the new business unit. 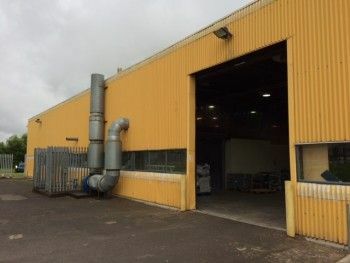 This involved the removal of mezzanine floors, forming new offices and retail space. It has been rewired and data points installed. Painting of the exterior and new signage were also completed. 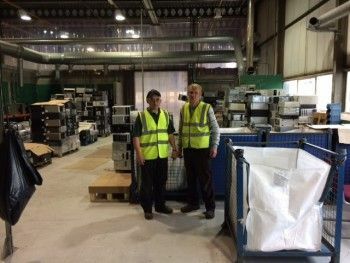 David Bowden, Managing Director and Co-Founder, said: “Our mission is to divert as much electronics waste away from landfill through reusing things that others may deem as waste. “Everything goes back into our communities across West Cumbria and Cumbria as a whole. We have been able to employ eighteen local people full-time (many from disadvantaged backgrounds) and two additional staff in our IT area – a full time IT professional and a single father working sixteen hours per week to balance his family life. Cumbria Recycling Limited is one of Cumbria’s leading recycling companies. Its drivers collect TVs, washing machines, tumble dryers and dishwashers from all the Household Waste Recycling Centres (HWRC) across Cumbria. Recycled white electrical goods are made available at very low prices to Housing Associations and community organisations, which are sold with a guarantee at a fraction of the price of high street retailers. They process over 31,000 televisions per year, 16,000 monitors and computer screens, 10,000 computers and laptops, and over 4,000 washers and dryers for re-use and sorting for recycling of raw materials.